Vegetable/Plant Growth Promoter and Enhancer Pesticide-free! 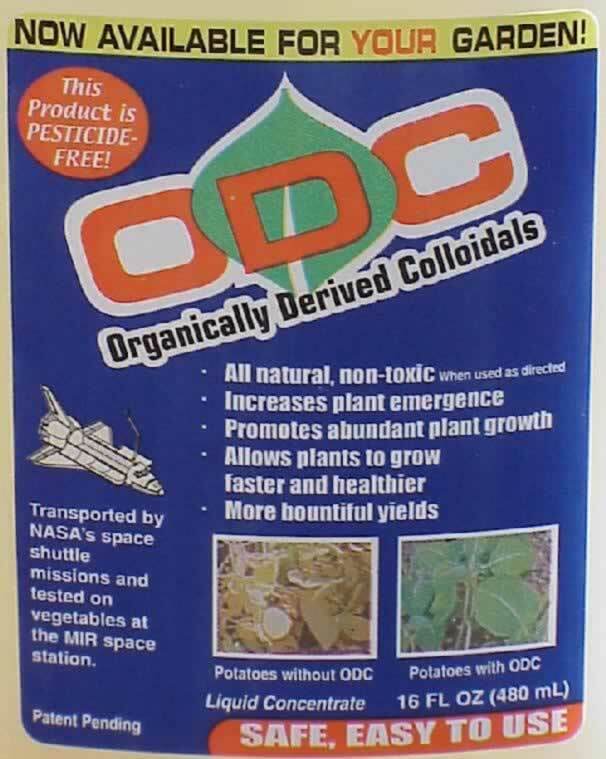 ODC now available: Make your garden pesticide-free starting now! Make your garden pesticide-free starting now! Promotes faster seed germination, makes stronger root systems, increases growth & yields, adds natural nitrogen to the soil, it's bio-degradable and much more! Proven Effective: Healthier Plants & Hi-yields! Covers over 1,000 sq. ft.
A great product for Organic Gardening! Reduce pesticides in your garden and grow the healthier plants with more abundant yields! "�the widespread use of pesticides - which raises cost and posts health problems - is one of the most pressing problems in agriculture worldwide� scientists foresee improved food safety and ground-water quality, as well as reduced farming cost with Aeroponics International's (ODC) product." This concentrate is an organically derived colloidal (ODC) substance that effectively promotes healthier vegetables and plants. In addition, ODC supplies plants with a natural slow release nitrogen. This product was developed for NASA as non-toxic bio-control to replace chemical pesticides. It can be used safely indoors or outdoors. Use ODC anywhere in your garden. ODC is environmentally friendly and its perfect for houseplants too! Tested by leading universities and used on the Mir Space Station as a potent plant growth bio-control.Now available for your garden! loads of new baby potatoes! 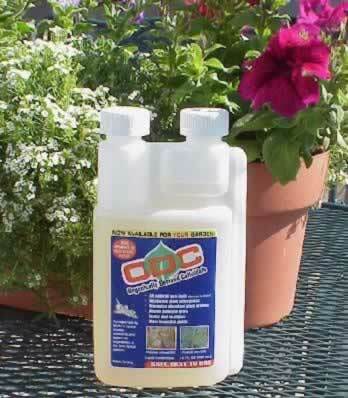 Pour 1 ounce of ODC into a one gallon watering can or container and water thoroughly around the base of your plants or seedlings - a small amount goes a long way. For best results, apply ODC/water solution directly to soil or growing media. Apply ODC often during the life of the plant. Pre-planting: Apply to the seed furrow after you cover the seeds with soil. Plant emergence: Apply after the sprouts begin to emerge from the soil. Seasonal: Apply to the garden or houseplants during the entire growing season. Does ODC contain sludge or sewage waste? ODC does not contain sludge, sewage, treated waste, manure, nitrates, ammonia, phosphates or potassium. Will it affect minerals that I apply to my garden? 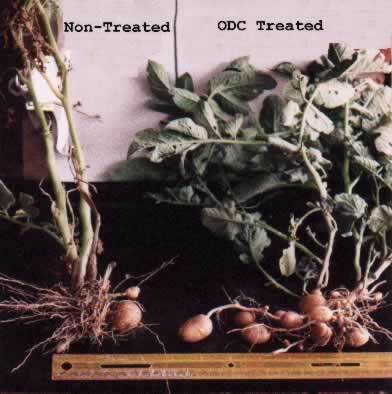 ODC does not affect the natural mineral uptake of plants. Has it been tested by independent research universities? Yes, has been tested by Colorado State University, University of Wyoming and Michigan State University. We are still participating in more R&D with major universities. Will the benefits of ODC last throughout the growing season? Yes, it can be used during the entire growing season. Do I have to spray ODC on my plants? It is not necessary to spray your plants. Simply add it to the soil and the base of the plants. Can ODC be used indoors in my house? Yes, it can be used indoors, around patios, sun porches and greenhouses. Is ODC an all natural product? Yes, ODC is a natural product made from all natural materials. Can ODC be used as a stand-alone supplement? Yes, it can be used as a stand-alone supplement. Can I use ODC on virgin land? Yes, use it where you do not want to apply chemical pesticides. Can I apply it to my compost pile? Yes, it can assist micro organism activity that breaks down organic matter. Can ODC applied as a foliage spray? Yes, but it is not necessary - just apply it to the base of the plant. What is the shelf-life of ODC? The shelf-life of the ODC concentrate and its solutions are indefinite. May I use ODC along with my fertilizers? Yes, it may be applied along with fertilizers and etc. Is ODC biodegradable in the soil? Yes, ODC is 100% biodegradable! Will it harm insect predators like wasps and ladybugs? No, natural predators will not be harmed. Use as directed. Can it be used around children and pets? ODC is non-toxic and safe. Use as directed. Can I apply ODC to my lawn , trees and shrubs? Yes, all plants can benefit from applications of ODC. Are any special tools required to apply this product? No, the ODC 16 oz. bottle includes a special measuring reservoir for mixing. Mix 1 oz. into one gallon fresh water. Why should NASA be so interested in our development of this product? NASA does not want to rely on chemical pesticides that could possibly harm humans and enter into the food chain and the environment. Will ODC build-up in the soil? No, it can be used over and over again to enhance plant growth. How often can I use ODC on my plants? As often as you like - every amount will make the plant healthier and promote better growth - repeat applications often. Can I use ODC in my hydroponic or Aeroponic system? Yes, simply add ODC (1 oz. concentrate per gallon) into the nutrient holding tank. How can I reduce transplant shock when transplanting my potted plants in the garden? Pour a dosage of ODC concentrate directly from the bottle onto the soil around the base of the plant. What is the best way from me to see how ODC really benefits my plants? 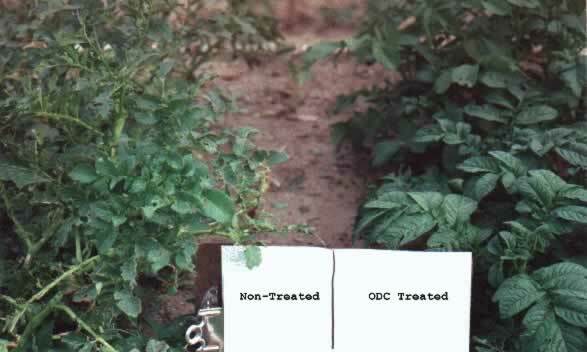 Select a group of plants and pour the ODC solution onto only half of them. Wait several days and make a visual comparison. Repeat ODC applications during the entire growing season. My tomato plants were infected when I purhased them. What can I do to revive them? 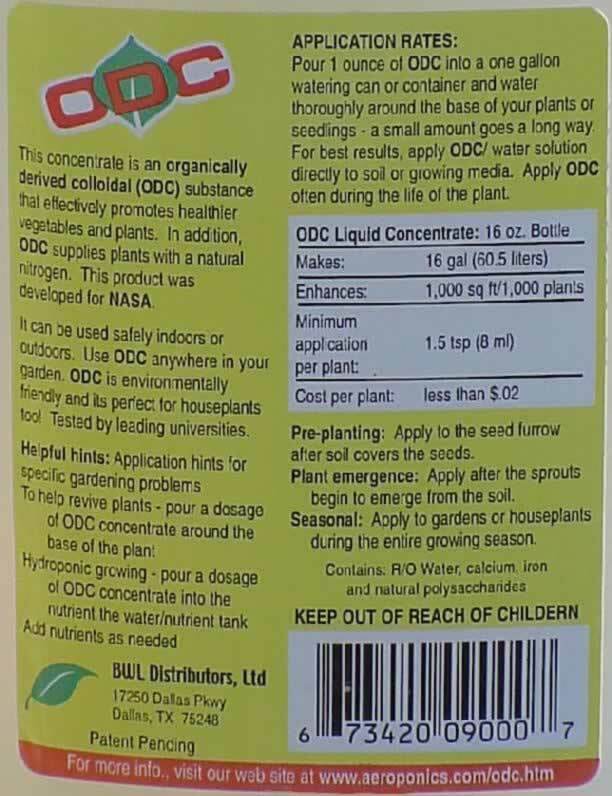 Pour a dosage of ODC concentrate directly from the bottle onto the soil around the base of the plant.